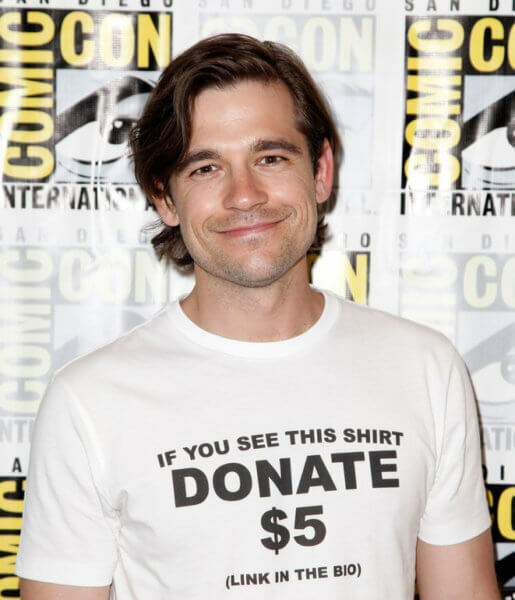 The first question I asked Jason Ralph during our roundtable interview at Comic Con was about the shirt and the charity he’s supporting. We also discussed what’s happening with Quentin and where we’ll pick up with the group in The Magicians‘ much-anticipated fourth season. Can you talk about the message on your shirt? Jason Ralph: “I’m raising money for Covenant House, which is a homeless youth shelter. I’m trying to raise $10,000 today. It’s an extraordinary organization that not only gives homeless youth the necessities of food, shelter, clothing, they also provide them with the resources to not only get off the streets but stay off the streets – education and all sorts of things, life experiences, job training. The thing that I found the most profound about it and something that I hadn’t thought of before…I’ve been working with this organization for the past four years and visiting numerous locations, teaching acting classes and stuff like that. The thing that I was struck with the most was a lot of these kids have never been told – sorry, it’s emotional for me – have never been told I love you or you’re good enough, or you can do this – you can succeed. That is something that I have so taken for granted. Everything that I have in my life is because of that, is because I was set up with that very base level of humanity. And, that is something that needs to be given. Have you witnessed a lot of success stories in the four years you’ve been involved? In season four of The Magicians, what’s happening with Quentin’s alter ego? Jason Ralph: “Quentin doesn’t exist. His name is Brian. I like to call him Bri Guy. He has a sunny disposition. It’s fun. From an acting perspective, we’re doing sort of like a hard reboot. We get to see these people experiencing magic all over again, but from a brand-new perspective. I think Quentin came at it with a lot of skepticism and was sort of perpetually disappointed with what he found magic to be. He was someone who suffered – felt like he suffered in his life and wanted a quick fix, and magic could do that. It was something that he always fantasized about it and then when it actually came true, it wasn’t like (he thought). There are no quick fixes in life, even with magic, and he learned that it wasn’t going to fulfill him in ways that he needed it to. I think he has a complicated relationship with it. Do you miss Quentin and Alice together? Do you have a relationship in mind for Quentin? So, Quentin is learning to love himself? One of the things the series does so well is tackling mental health issues. How do you prepare for those scenes? So, you take mental health issues very seriously? Jason Ralph: “I do take it very seriously. It’s something that I put a lot of focus onto. It’s something that we as a cast were drawn to the story for. It’s something that I think the books talk about in a way that I’ve really never experienced fantasy broaching. I think it’s a nuanced perspective. That said, are there any light moments in the next season? Tone-wise, what do you think about this season compared to the others? Jason Ralph: “We’re right at the beginning. The tone of the show is kind of all over the place in an exciting way. Sometimes it’s a drama and sometimes it’s a comedy. Sometimes it’s both, and sometimes it’s a musical. Sometimes it’s a mystery and sometimes it’s an adventure. Sometimes it’s a thriller. That kind of stuff. The writers have provided themselves a lot of freedom to explore genres. Is it your own blood or someone else’s? What is it like playing scenes with Hale given the history between Quentin and Eliot now that Eliot is a monster?